As World War II and the Vietnam War defined their eras, the War on Terror has defined ours. While the war is typically considered to have begun on Sept. 11, 2001, its historical roots extend back to the 1980s and U.S. involvement in the Middle East. 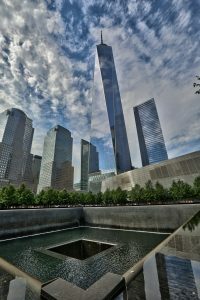 Participants will examine the history of events that led up to 9/11, engage the various themes that comprise the history of the wars in Iraq and Afghanistan, and interact with both acclaimed scholars and veterans, including a Medal of Honor Recipient, providing a scholarly understanding of the world today. Meet Medal of Honor Recipient Sergeant First Class Leroy Petry, US Army (pictured below) who will share his experiences from Afghanistan. Previous speakers have included Colin Jackson, Deputy Assistant Secretary of Defense for Afghanistan, Pakistan, and Central Asia; Dipali Mukhopadhyay, Columbia University’s assistant professor of International and Public Affairs; Eric Davis, Rutgers University Political Science professor; and Muhamed H. Almaliky, Weatherhead Center for International Affairs at Harvard University. Medal of Honor Recipient Sergeant First Class Leroy Petry, US Army (Afghanistan), shown here in the Medal of Honor Grove at Freedoms Foundation at Valley Forge.